Ilona Feher was a Hungarian violinist and teacher born on December 1, 1901 (Heifetz was born the same year.) 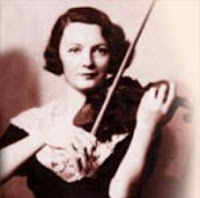 She is remembered as a teacher rather than as a violinist. Many biographical writings mention her striking beauty. She studied with Jeno Hubay at the Franz Liszt Academy (Budapest) and began concertizing at an early age, until the Second World War interrupted her career. For a number of years after the end of the war, she played exclusively in Eastern Europe. In 1949, she moved to Israel, where she lived and taught for the rest of her life - nonetheless, she gave master classes all over the world as well. Shlomo Mintz is among her well-known pupils. I do not know if she ever did any recording - commercial or live. I'm estimating that Feher died on January 1, 1988, at age 87.